I’d been planing to cook a Christmas Pie for our veggie dinner for some time, and came across an old article in something like the Good Food magazine which looked like a promising avenue of inspiration. Although this did for the basis of my recipe, there were one or two elements didn’t like, or in hindsight just didn’t work very well so this version reflects my retrospective fixes. This recipe uses a hot water crust pastry, which is great fun to work with and really throws the pastry rule book in the bin. This is a great pastry that you can really abuse and gives a wonderful deep golden brunch crust (just think of Pork Pies…). Being vegetarian I’ve used a vegetable shortening, but your veggie principles are a bit lax you could opt for lard. One word of caution – my original notes had the pie left in the tin until serving. DO NOT DO THIS! The pastry will go soggy, the baking paper will tear and the pie will collapse! Sweat 3 finely chopped Onions and 3 cloves Garlic in a little Olive Oil until soft. Take the excess, reconstitute into a ball and roll out to make a very generous lid for the pie. Can this pie be made ahead and frozen? Although I’ve not tried freezing this, I don’t see why that would be an issue. 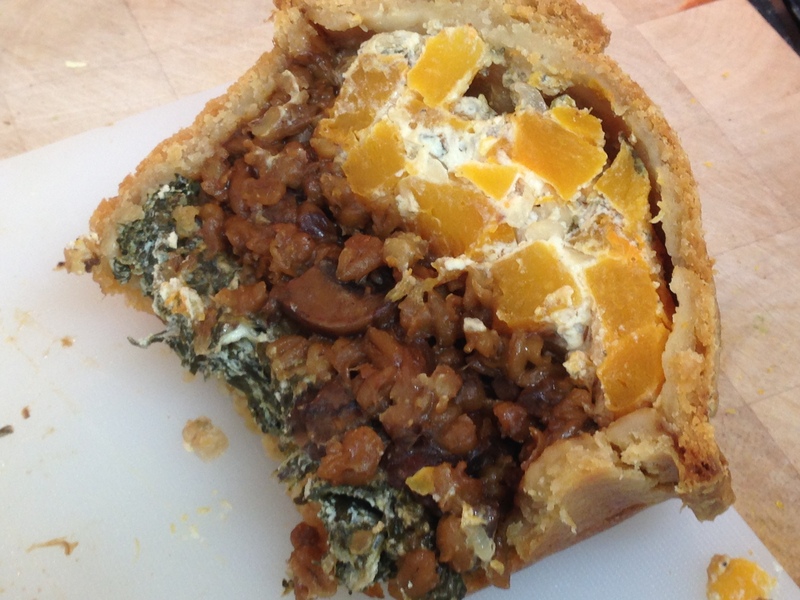 There are plenty of comments around on successfully freezing raised pies, both raw and cooked. Personally I’d assemble the pie and freeze before it is baked, then ensure it is fully defrosted cooking in the oven. Enjoy!